A unique concept in nitrogen fixation for Lucerne, the Eco-Rhiz Lucerne Twin Pack combines Eco-T (T. harzianum) and Eco-Rhiz Lucerne nitrogen fixing Rhizobium for optimum nodulation and fixation. The unique formulation Rhizobium offers high bacterial counts in a protective capsule that does not require co-application of sticker products. Combine inoculant with damping-off disease suppression and root growth stimulation in one application. Synergistic action stimulates healthy, well-developed root systems and numerous active nodules. Crop specific, locally sourced Rhizobium strains. Well-known and effective strains adapted to locally planted crop varieties and climates. Seed treatment. Nodulation initiates early in seedling development soon after germination. 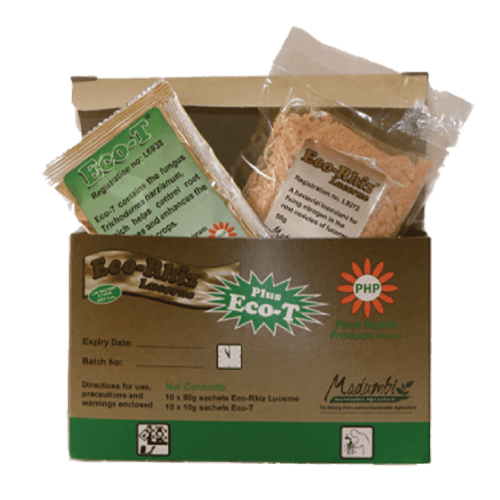 How do Eco-Rhiz Inoculants work? Rhizobium bacteria are a special kind of bacteria that form symbiotic (mutually beneficial) relationships with leguminous plants. These bacteria can convert N2 gas from the atmosphere into ammonium, which is a plant available form of nitrogen, thereby supplying a natural source of nitrogen to their plant hosts.. This natural process of nitrogen fixation takes place inside root nodules. In this process, the rhizobium bacteria supply the plant with nitrogen while the plant supplies the rhizobium with nutrients and a protected home. 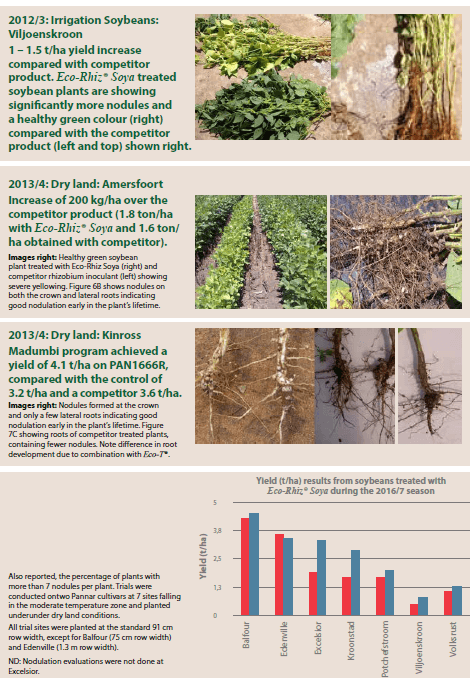 While natural soil populations of rhizobia do exist they are often not sufficient to support proper nodulation and inoculating leguminous crops with high populations of the right rhizobia can significantly improve root nodulation, plant health and yields. Trichoderma asperellum, the active ingredient in Eco-T®, is a beneficial fungus that forms a symbiotic relationship with plant root systems offering the plant numerous benefits. T. asperellum is aggressive, fast growing and quickly colonises a root system, out growing fungal pathogens and out competing these pathogens for space and nutrients in the root zone. T. asperellum parasitizes other pathogenic fungi by coiling around the pathogen hyphae, constricting and penetrating (via enzymatic secretion) eventually destroying it. T. asperellum activates SAR, a state of enhanced immunity to infection demonstrated by plants following an initial localized injury or presence of inducer organisms like T. asperellum. In response, the plant produces certain substances that, over time, evoke resistance throughout the plant. Root growth is also enhanced due to plant-like hormones produced by T. asperellum as it grows on the roots, ensuring new root hairs are formed for nodulation to occur.